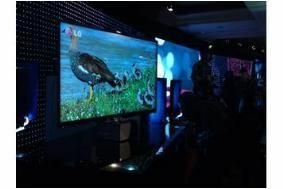 CES 2010: LG unveils Infinia LED, wireless HD-ready, Skype and 3D TVs | What Hi-Fi? But there were plenty more surprises in store. At the heart of LG's 2010 TV line-up is the new Infinia range with Full LED backlighting, NetCast web connectivity on two thirds of its TV range, wireless HD video transmission (using a plug-in dongle) and, like Panasonic, the ability to make Skype voice and video calls on some models. The slim Infinia design (just 23mm deep) includes four LCD and two plasma Fulll HD models: LE9500, LE8500, LE7500 and LE5500 in the LCD line-up, and PK950 and PK550 for the plasmas. LG says the flagship Infinia models will also be 3D-Ready and will work with Sky's 3D TV service. But the real star of the show is LG's Ultra-Slim model (pictured) which is a mere 6.9mm deep. Other surprises included an 'eco' Chocolat smartphone with a solar charging panel on the back, a smartphone with built-in projector, and what LG claims is currently the world's largest commercial OLED TV with a 15in screen. Wireless HD connectivity is a big theme here at CES, and LG's solution is to offer a wireless dongle that can transmit Full HD video at a range of up to 30m. Not only its Infinia TVs but also its 2010 Blu-ray players will be network enabled for access to LG's NetCast portal, which includes widgets for Netflix, Yahoo, YouTube, Skype, Picasa and AccuWeather.